Last week, we talked a little bit about Frank Gore's new situation in Indianapolis and what the Colts could mean for his fantasy value. This week, we want to look at Gore as an individual player and how his skills have aged throughout the years. Gore has been a model of consistency ever since he came into the NFL in 2004 out of Miami. A durable back who embodied a hard, physical running style that involved shedding tacklers in addition to an ability to catch the ball out of the backfield made Gore one of the most reliable backs to have on your fantasy team. Now, a lot of people would say Gore wasn't a fantasy relevant player in 2014, even going as far to deem him unstartable at times. Still, he finished 17th among all running backs in fantasy points with 135 total points. That's an average of 8 fantasy points per game. Those are good RB2 numbers if you're in a deeper league and great flex numbers in standard 10-to-12 team leagues. In 2013, Gore finished 13th in fantasy points among RBs in fantasy points with 166. He scored nine touchdowns that season, five more than he did in 2014 where he registered just four scores. His fewer touchdowns can be attributed to rookie Carlos Hyde who sniped four scores away from Gore that year. So if you add the touchdowns that Hyde siphoned from Gore's 2014 touchdown total, (assuming your league scores six points per touchdown) that would give Gore 159 total fantasy points, which is only 7 points shy of his 2013 total. Sometimes the value of a running back can really be altered by a few touchdowns that are either given or taken away from him. We saw an example of that in 2011 with LeSean McCoy. McCoy set a franchise record 17 touchdowns that season. While McCoy's numbers strongly benefited those who drafted him to their fantasy teams for reasons stated above, it wasn't so great for those who drafted Michael Vick. Vick scored just one rushing touchdown in 2011, which paled in comparison to 2010 when he rushed for nine scores. I could name more examples, but you get the point. A running back's touchdown numbers often fluctuate, however their yardage numbers tend to stay the same barring injury. Why Gore has been successful? Durability and a high volume of carries are two of the biggest reasons Gore has been successful despite aging. Gore has logged the second most carries with 2,442 rushing attempts between 2005-2014, trailing only Steven Jackson. Durability has been a product of that longevity. Gore hasn't missed a game in four seasons. That, plus the run-heavy offense former coach Jim Harbaugh incorporated when he arrived in San Francisco in 2011 no doubt played a role as well. Gore remained a threat for a 100-yard game at times last season because of his chances at getting a large workload within the offense. He didn't rush for over 100 yards without needing at least 18 carries to do it in 2014. How many times the Colts hand Gore the ball will be crucial in determining his yardage totals in 2015. So if Gore relies on volume for productive rushing games now, the Indianapolis Colts may be a team that downgrades that volume a bit. At times last season, the Colts completely abandoned the run and instead favored a high-volume passing attack with quarterback Andrew Luck. Now, the Colts had a very pedestrian running back gore with Trent Richardson so it's easy to understand why they didn't want to hinge their success on him. Still, the Colts are a team that knows they have one of the best passers in the league and will look to get as much mileage out of that as they can. We just mentioned how much the Colts like to throw the ball and how it potentially hurts Gore's potential at seeing a high volume of carries. 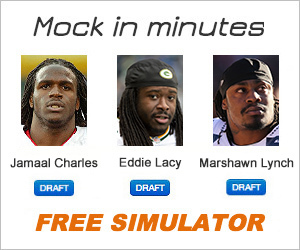 But, it could also help Gore in PPR leagues. Gore has long been an above average receiver for his position. He amassed several 50+ catch seasons which helped him finish with 1,500 total yards combined rushing and receiving. It's likely Gore could assume the same role Ahmad Bradshaw had with the Colts last season. If you remember, Bradshaw caught six touchdowns passes before getting injured halfway through the season. It's likely Gore will be just as much of a threat around the red zone as Bradshaw was due to his catching ability and Luck's tendency to throw the ball to running backs in the red zone (the old spider 2 Y banana) as coach Jon Gruden likes to say. One of Gore's best games in 2014 came late in the season against the San Diego Chargers. At home on a Saturday night, Gore showed he could be the guy at times in the NFL. Though he's clearly not the explosive running back he was in the mid-to-late 2000s, he managed to score a touchdown on the 49ers opening drive. When you watch, you'll see Gore takes the hand off, waits for the hole to develop, shows his ability to shift laterally by cutting back before exploding off-tackle. He then breaks two tackles and stiff arms his way into the end zone for a 52-yard touchdown. Of course, you have to give props to the downfield blocking of San Francisco on that play, in particular lineman Joe Staley. But the most important trait Gore displays in this clip is vision. He's able to create speed mentally through decisiveness. When he sees the hole open up, he hits it with purpose. It makes a big difference when you can anticipate the play ahead of time if you're slow. Trent Richardson found this out the hard way.